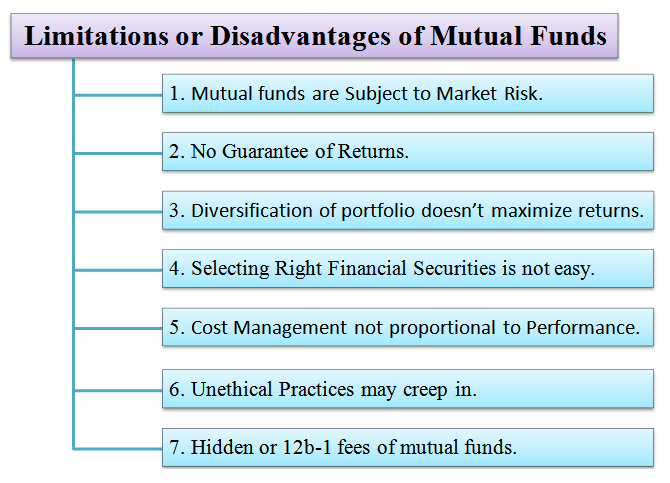 The seven prominent disadvantages of mutual funds are depicted below. Diversification of portfolio doesn't maximize returns. Selecting right financial securities is not easy. Cost management not proportional to performance. Unethical practices may creep in. Now let's discuss above limitations of mutual funds one by one. "Mutual Fund investments are subject to market risks. Please read the offer document carefully before investing." Mutual funds do not give any guarantee of the returns for the investments made in its various schemes. Mutual fund helps to diversify the portfolio. However, though the diversification of portfolio helps in minimization of risk, these do not results in maximization of returns to the investors. It's difficult task for a mutual fund manager to select appropriate and suitable financial securities for investment to generate higher returns. Mutual fund managers are one of the highest-paid executives in the finance domain. Furthermore, the fee paid to the Asset Management Company (AMC) is no way related to the performance of these funds. Mutual fund managers may follow unethical (corrupt) practices to boost the performance of the various fund-related schemes. Hidden fees are popularly known as '12b-1 fees'. It is basically a sum of annual distribution fees or marketing fees. The 12b-1 fee derives its name from a section in the Investment Company Act of 1940, United States. 12b-1 fees are disclosed in the mutual fund prospectus and can also be found on the official website of such issuer organization. There would be certain disadvantages of investing in almost all investment-prospects. However, in case of mutual funds, the risk of disadvantages can be mitigated (reduced) by preparing a list of its limitations. Once such a list is prepared, then each item (disadvantage) in the list shall be scrutinized and determined to decide whether it applies as a disadvantage of mutual fund or to a particular scheme of it.